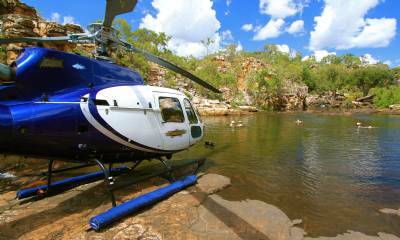 Twenty-Five $1000 Heli-Packages to Celebrate 25 Years! Twenty five years ago to this very day the original TRUE NORTH sailed into Broome for the very first time. Much has changed since then but one thing remains the same – an adventure on the TRUE NORTH is still one of the world’s most unique holidays. And to celebrate this very auspicious occasion, North Star Cruises is giving away 25 heli-packages valued at $1000 to the next 25 people who book either one of our remaining 2012 Kimberley Ultimate cruises or, any 2012 PNG departure! Plus, we’ll make sure there is a bottle of champers waiting for you on-board!